It is always delightful to see beautiful birds in Costa Rica with brightly colored plumage, but I find what interests me more these days are the elusive, subtle birds whose behavior is camouflaged in forest colors. I’m challenging myself to find some of these secretive birds in dark and difficult habitats, to learn about their characteristics, and then to try to capture their essence in photographs. “Trying” is the gerund that governs here. When I fail, which is most of the time, at least the blurry image—and the memory of how the bird behaved while I was stalking it–can be instructive. Side by side in the two essential Costa Rican bird guides (see below) are the Ruddy-capped Nightingale-Thrush and the Orange-billed Nightingale-Thrush. They are members of the Turdidae, or thrushes, of which there are fifteen species in Costa Rica, including four “passage migrants”. Many are known more for their attractive songs than for their plumage. In fact, one of these thrushes is downright plain—completely costumed in brown—but it is a distinguished resident: the Clay-Colored Thrush is the National Bird of Costa Rica. What? Not the luminescent Resplendent Quetzal? Not the gregarious Scarlet Macaw? No, it was chosen by the Congress because it is a bird whose compelling song can be heard by Ticos (Costa Ricans) no matter where they live in the country. It seems appropriate that such an understated bird was selected, as the Ticos I know value humility above all other aspects of human character. 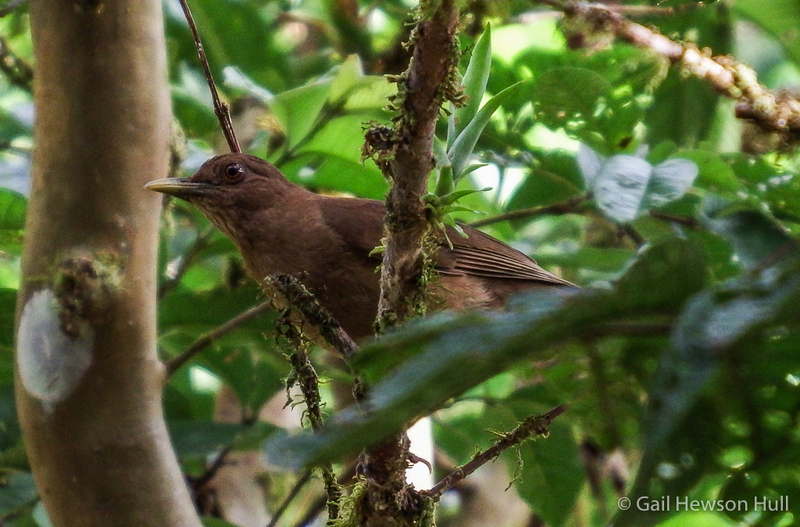 I had a chance to see the Ruddy-capped Nightingale-Thrush early this year at high elevation, around 7000 feet (2000 meters) at a wonderful mountain birding site called San Gerardo de Dota. The bird was going in and out of forest edge thickets. I followed it as it hopped along and felt an immediate attachment to it. The thrush seemed shy as it retreated, and yet feisty and unafraid as it emerged from cover once again to search for ground insects, or low bush insects and berries. In the woods recently at Finca Cantaros I heard the loud, clear and varied song of a bird and vowed to find it in the foliage. 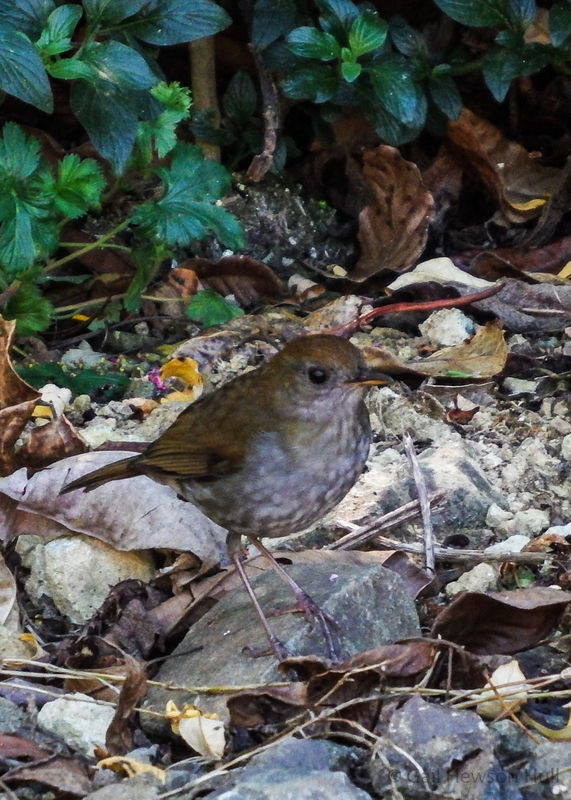 Not until I spotted it singing in full-throated vigor in thick hillside forest terrain did I recognize it was the Orange-billed Nightingale-Thrush. This is a bird that is called “shy and retiring”. Yet it let me get close to it. Since it was repeating its song over and over, I now know that song. That knowledge, and that bird’s sheer will to sing, made my whole day. 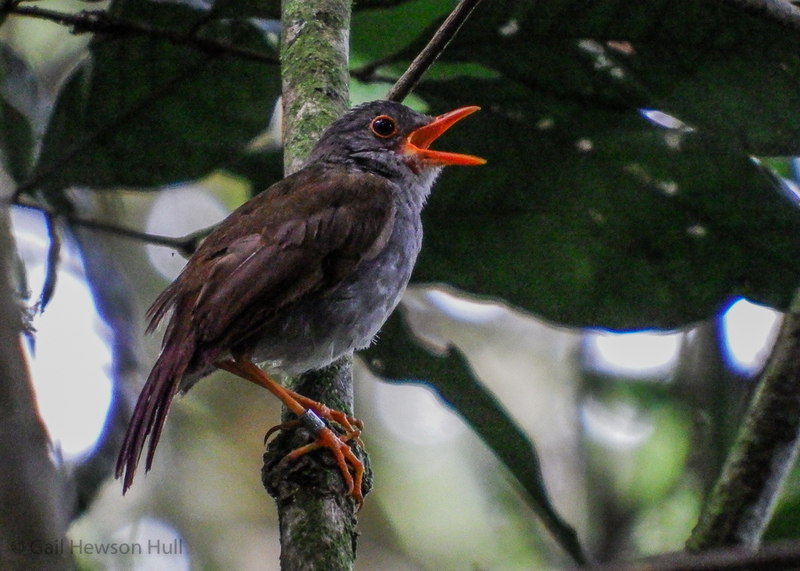 To hear a 34-second recording from Xeno-Canto of the song of the Orange-billed Nightingale-Thrush, click here and an audio player will open in a new tab/window. Then click the play ( ►) button. Close that tab/window to return to this post. 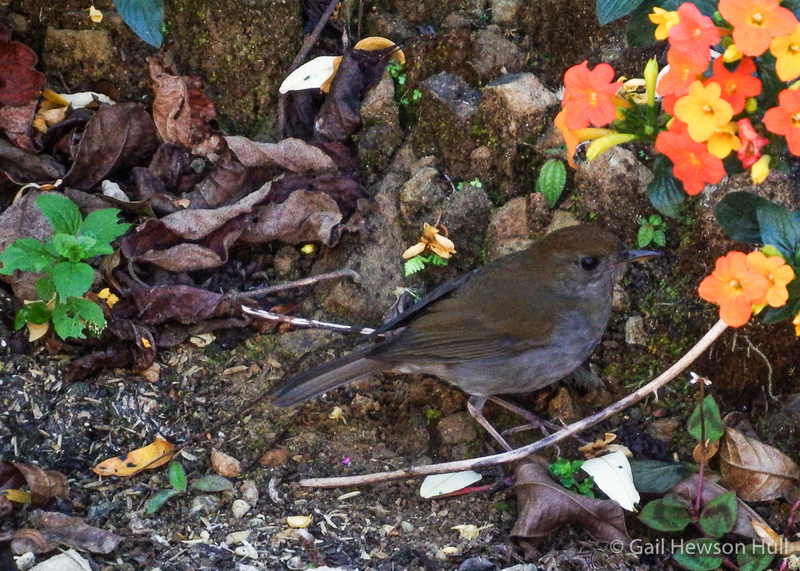 Note right leg band on the Orange-billed Nightingale-Thrush. For information about the bird monitoring project, organized by volunteers of the San Vito Bird Club for over one decade, click here. A Guide to the Birds of Costa Rica by F. Gary Stiles and Alexander F. Skutch, illustrated by Dana Gardner, Comstock Publishing Associates, a Division of Cornell University Press, 1989, p. 369. The Birds of Costa Rica, A Field Guide by Richard Garrigues and illustrated by Robert Dean. A Zona Tropical Publication from Comstock Publishing Associates, a division of Cornell University Press, Ithaca, New York, Second Edition, 2014, p. 266-267.